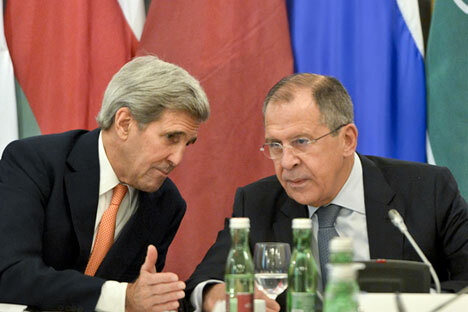 U.S. Secretary of State John Kerry and Russian Foreign Minister Sergei Lavrov. Russian Foreign Minister Sergei Lavrov and U.S. Secretary of State John Kerry have exchanged views on the Syrian issues during a telephone conversation, the Russian Foreign Ministry said. "Both parties have supported the efforts of UN Special Envoy Staffan de Mistura to organize the talks between representatives of the Syrian government and opposition in Geneva for the purposes of reaching a political settlement," the ministry said. Lavrov "pointed out that any attempts by some opponents of the Syrian administration to set preliminary conditions ahead of the start of the negotiation process in violation of the UN Security Council Resolution 2254 are unacceptable," it said. Lavrov highlighted once more how important it is that "the delegation of opposition forces truly represents their entire specter, also pointing at the need to establish a united front to fight against ISIS and other terrorist groups," it said.